Maybe your fifth hour is always the hardest, or maybe you’ve got the toughest third grade group you’ve had in years. Whatever it is, things aren’t going the way you’d like them to. Students aren’t following directions, are constantly off-task, and transitions are taking forever. 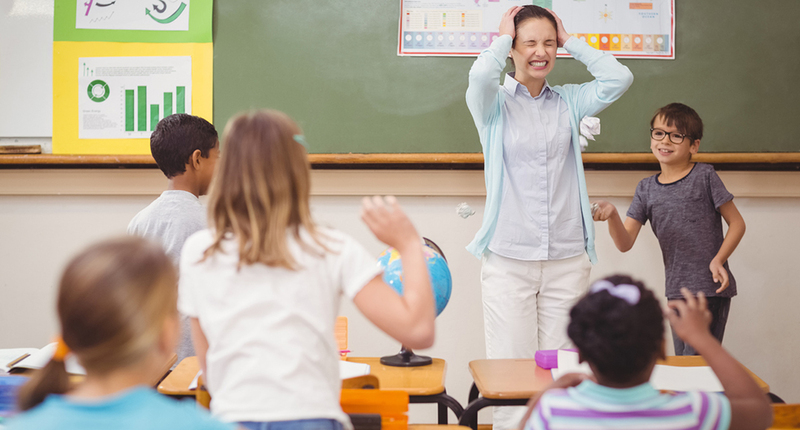 Valuable instructional time is replaced with managing student behavior, and you’re losing that excitement you felt at the start of the school year. Build relationships. This is your most important strategy. Get to know your students. Allow them the opportunity to get to know you. Make connections. Students will always work harder for teachers that intentionally connect with them. Identify the ringleaders. This student is a leader in the class, but uses their influence to distract and detract from the learning. Work hard to “win” this student. Talk to them before class starts. Acknowledge that they are leaders and convince them to join your side. If this fails, there are situations where assigning a (deserved) consequence to the leader of the group will send a clear message to the rest of the group. Use your resources. There are a lot of people besides you that are interested in the success of your students. Reach out to other teachers, counselors, parents and administration for help with difficult students. If the student plays a sport, their coach can sometimes be the best lever for improving behavior. Stop giving warnings. We always expect that a few warnings will be enough and that students will turn around their behavior. There has to be a line drawn where consequences are given for crossing it. Pro tip: don’t drop this new strategy on students in the middle of a random Tuesday. Instead, start the day (or hour) by making it very clear to students that you are done giving warnings and that consequences will be assigned for certain behaviors. (1) Teacher makes the seating chart by putting students where they will be most successful. Move the ringleaders closest to you. Pair struggling students up with the students who are your best teachers. Split up the students that are too social. Don’t feel bad about changing seats. (2) Students choose the seating chart. Consider framing this decision for students by saying, “Please choose a seat which will best support your learning.” If they choose a seat that later proves to be a problem, you can refer back to this statement to have them realize they should move to a new seat. Hallway conversations. Rather than addressing the whole class about specific behavior concerns, talk to individual students one-on-one. Identify the behavior, explain why the behavior needs to be changed and then hold the student accountable. Pause and reframe. You have permission to start over. Tell the class that you are not happy with the way things are going and that you want to start over. Involve them in the conversation about how it’s going to be different this time. Give directions once, and only once. Research shows that the more times a teacher gives the same directions, the less students will listen. Try getting to a point where you can provide directions that are so crystal clear that you only need to deliver them once. This requires you to be thoughtful about what to say when you are lesson planning. These steps can take time, but remember that tomorrow is another day for yourself and your students. Good behavior management takes hard work and effort, but is well worth it when you’ve got a classroom of prepared individuals with a strong understanding of your expectations. Thank you to the Rising Teacher Leaders in Kentwood, MI, for helping to create this list.